Each Pack is approx 113.4g (two sticks combined). For the restoration of terracotta and other ceramics. Also for the repair of garden urns, pots, Statuettes and damaged brickwork, etc. Also for sculpting and modelling. The two sticks have a long shelf life but once mixed the resultant putty is at first soft and highly adhesive and then gradually hardens. Speed of hardening is dependant on temperature and at normal temperatures (20-25ºC) Milliput becomes rock hard in three to four hours. By the application of heat the setting time can be reduced to a few minutes. After setting hard Milliput continues to cure and is fully cured after an elapse of time equal to the setting time at the same temperature. Once fully cured Milliput can be machined, drilled, tapped, turned, filed, sawn, sandpapered and painted. Milliput can be sandpapered and painted immediately it has set. (it is advisable to wear eye protection during this process). 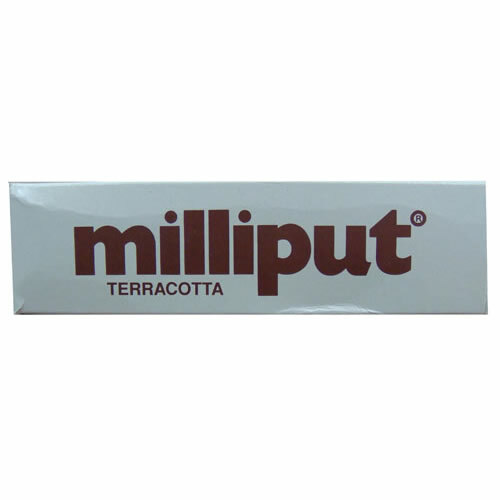 Milliput is an excellent adhesive and will bond any of the following to itself or to any of the others - wood, brick, cement, metals, concrete, plastics, glass etc, but note that Milliput is not intended as a thin layer adhesive and should not be used where a paste, mucilage or thin glue is indicated. Milliput will set under water and is heat resistant up to 130°C. Recommended that Milliput is stored in cool, dry conditions. Please reseal bags after use. Stored correctly this product should remain workable for about 2 years. Temporary repairs for car petrol tanks, batteries, radiators and exhausts.